I can’t believe it, but 2018 is only a few weeks away! 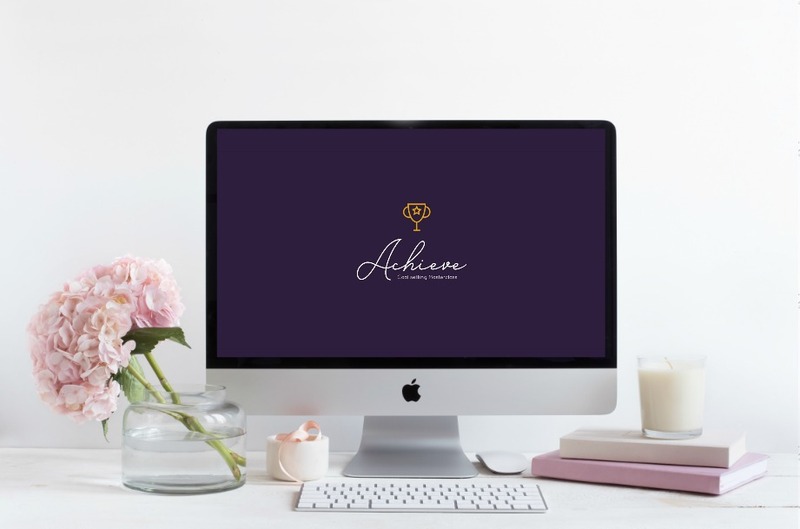 I’m super excited about all the changes that are coming (like the long-awaited site redesign and YouTube channel I’ve been talking about for months!! ), but we don’t have to wait until 2018 for all of the surprises. One is ready today! 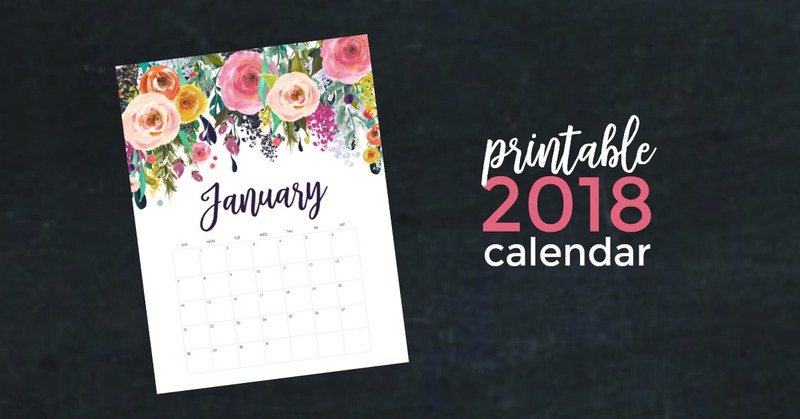 It’s a brand new printable 2018 planner for the new year! 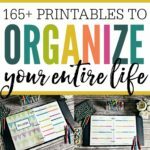 A couple years ago, I made my large life planning printable set, This Organized Life. 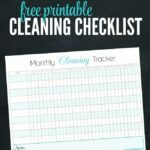 It has an undated yearly calendar, and pages for meal planning, finances, housekeeping, kids stuff, and more, and while I still love and use it for most of my family’s needs, I was itching for a change for my day to day scheduling. I wanted a new design and weekly page layout so I started working on the new printable 2018 planner set, Happy Organized Year! Aside from the beautiful new design, I’m most excited to include a new feature so many of you wrote in requesting… dated pages! 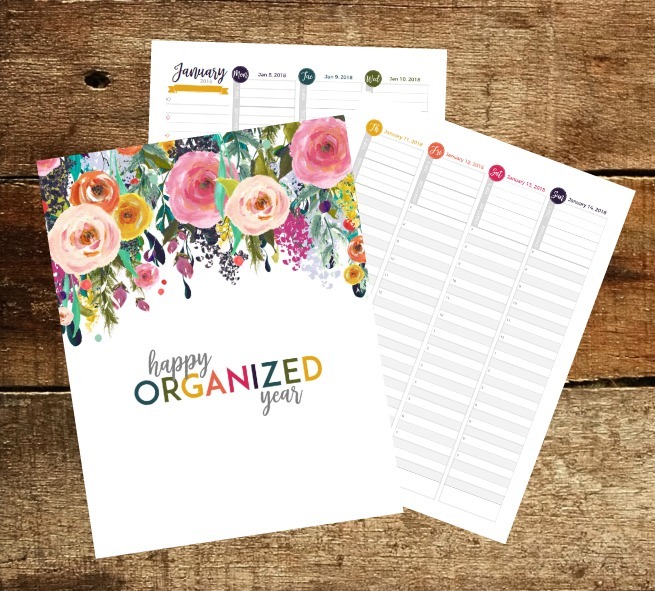 I always strive to make my printable sets as customizable as possible so the Happy Organized Year planner includes two sizes, one for those who like large planners (standard computer paper size, 8.5×11), and a smaller size for those who like to have something a little more compact and easily portable (half letter 5.5×8.5). 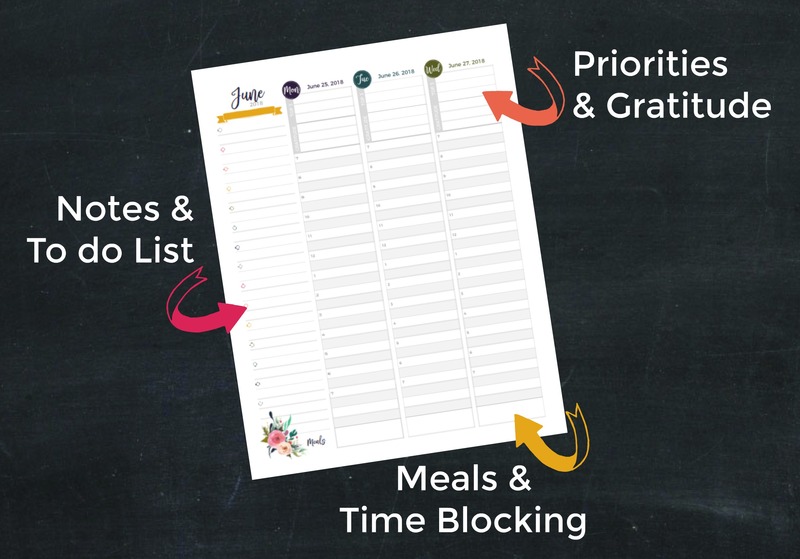 For those who want a little more flexibility to their days or who need to plan for times outside of the 7am-7pm window, I’ve also included blank versions with all of the same spaces, but without the hours, meals, top 3, and gratitude areas labeled so you can add your own categories and times to make the planner work for your life. 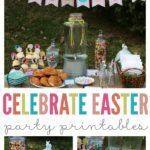 And, of course, when I start making printables I go a little crazy so I didn’t stop there. One of my favorite things about a new year is setting New Year’s resolutions. I don’t think we need a new year to set goals and work towards bettering ourselves and our lives, but there’s something about the blank slate that a new year offers that energizes me and makes me feel like anything is possible. This year, I’ve made something extra special… a corresponding workbook all about setting and achieving goals called Happy Organized Goals! I’m offering them both separately and together because I know some people won’t need or want both. Maybe you already have and love This Organized Life and only need the goal setting workbook to supplement the system you’ve already set up. Maybe you want a dated planner for 2018, but goal setting isn’t really your thing. Great! 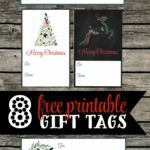 I want these printables to be as flexible and customizeable as possible so you have only what you need and want and nothing you don’t. For those who are determined to not only set goals but also achieve them, I’m creating a brand new goal setting masterclass called Achieve! Achieve is for the person who is tired of setting goals and not achieving them. It’s for the person who makes a resolution every year, but can’t seem to even make it through January before feeling like everything’s fallen apart. Achieve is for the person who is serious about making changes in her life and wants more help and accountability in achieving her goals. The Achieve goal setting masterclass will contain multiple videos that explain the science behind goal setting, how to use the Happy Organized Goals workbook for the best possible results, and a private, eight week facebook group where we can support, encourage, and inspire one another to plan, stick with, and achieve our goals as we begin the new year. Just imagine where you’ll be a year from now if your goals are successful! The Happy Organized Year planner, Happy Organized Goals workbook, and Achieve video goal setting masterclass will officially launch Tuesday, December 19th, but as a special holiday treat for my readers, starting today, you can reserve yours at a special pre-launch price! And since waiting a week and a half can feel like an eternity (at least according to my kids! ), I’ve included a brand new printable yearly calendar that will be available immediately for everyone who pre-orders. Yay! We all know, from years of experience and failed resolutions, that a great year won’t just happen on its own. We need to have a plan, and that’s exactly what the 2018 planner, goal setting workbook, and Achieve masterclass provide for us. I can’t wait for you to get your copy and to hear about everything you’re going to accomplish now that you have an easy to follow game plan. Just imagine where you’ll be a year from now!! 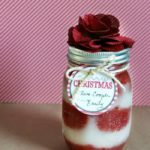 Next Post Setting Goals for 2018 & a Giveaway! 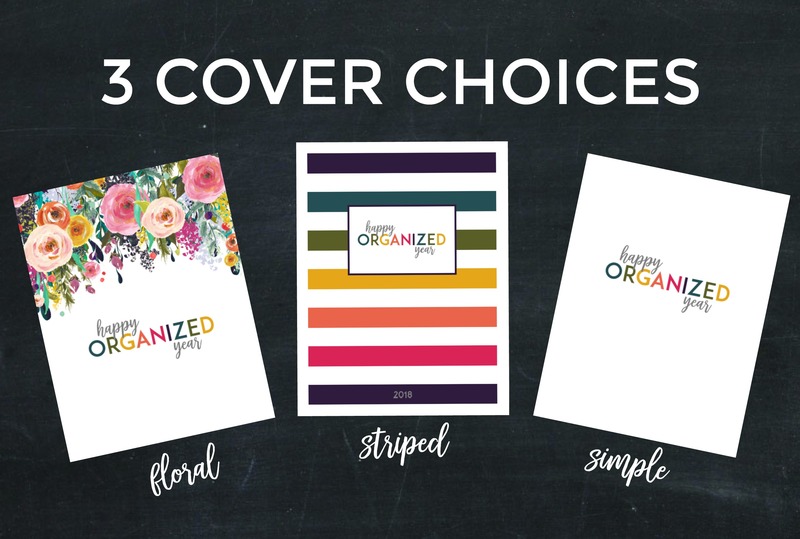 Getting your organizer. Will put it to good use. A side note. I lost 88lbs in one year, 60 on my own the rest with weight watchers. As with anything worthwhile it was not easy but I reap the benefits everyday. Stick with it and it works. Thank you. That’s amazing, Helen!! I lost 18 pounds in my first 6-7 weeks, but I’ve completely fallen off the wagon! 🙁 Did you ever get derailed? How did you start again? With all the plan changes (and fewer points! ), I’m having a really hard time. Thank you so much for the encouragement! I bought the planner about a week ago. Never got an email with the calendar printable or anything about how I will get the planner. Will it be emailed to me when it is ready? Thank you for your help! Hi Monica, You should’ve received an email immediately after checking out. Usually, when this happens, there’s either been an accidental typo at checkout, people are checking the wrong email account, or the message has ended up in a junk folder. I did have another Monica email be about this yesterday so if that was you, just ignore this message as I’ve already written back. 🙂 If it wasn’t you, please email me at emily@myloveforwords.com with the email address you purchased with, and we’ll get things sorted out. Thanks! I have been trying to contact you through Etsy regarding a purchase that was to include every single set plus all future designed sets. I have no way to access any new sets and I haven’t heard any response. Any help would be appreciated. I want to buy one of your full sets. I am looking for one that has daily pages. Either one or two pages per day. Do you have that? Or only the weekly spread? Hi Sarah! Thanks so much! Are you looking for individual calendar pages or daily pages that can be used for time blocking, tracking tasks and to dos, etc?